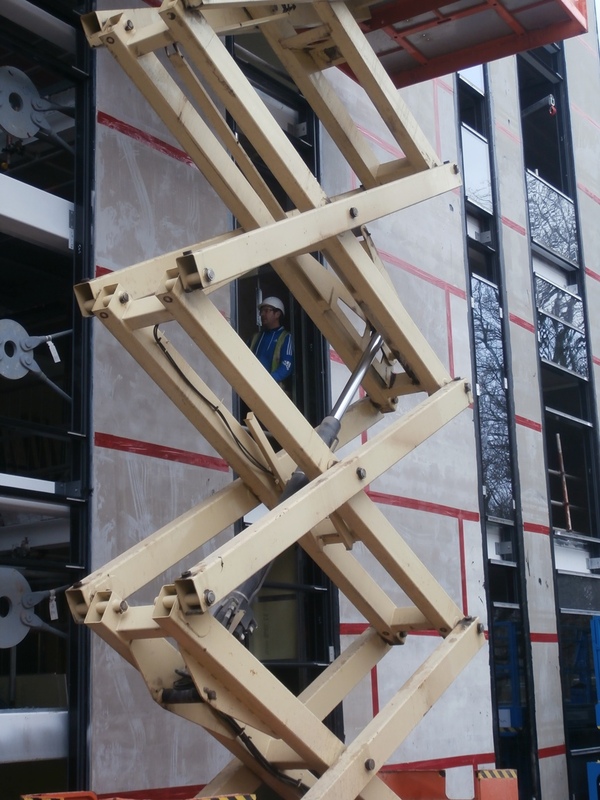 I’ve focused on the refurbishment of the Church High old building – and the history revealed in the process – so much of late that you’d be forgiven for forgetting there is a new building taking shape too. You may remember I toured its outer structure on January 13th and first stepped foot inside the ground floor on February 23rd and 24th. It took another month before I got into the building properly. The interior of the new building looks enticing. The very same view, this time from ‘inside out’. 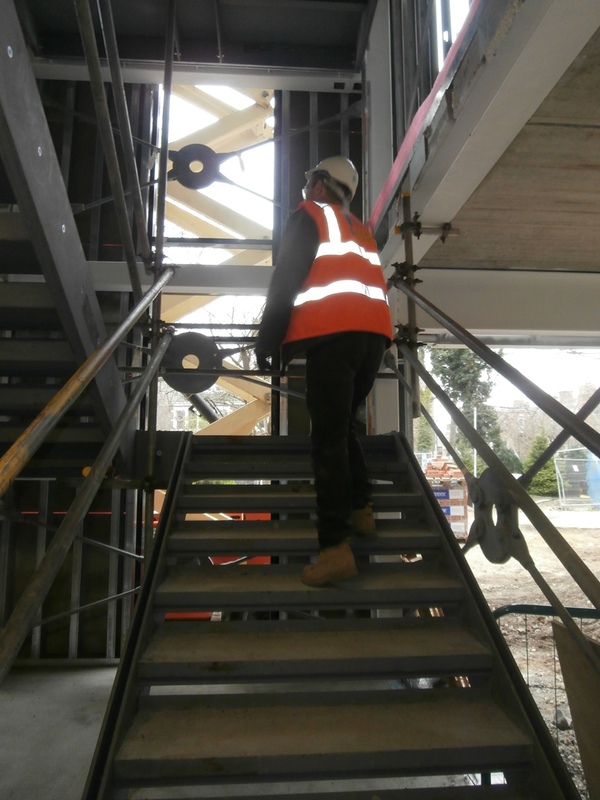 My guide was once again ‘chief baby-sitter’, Peter Wilson, and it was a real thrill to be walking up the new staircase I’d previously photographed only from the outside as it was being assembled. 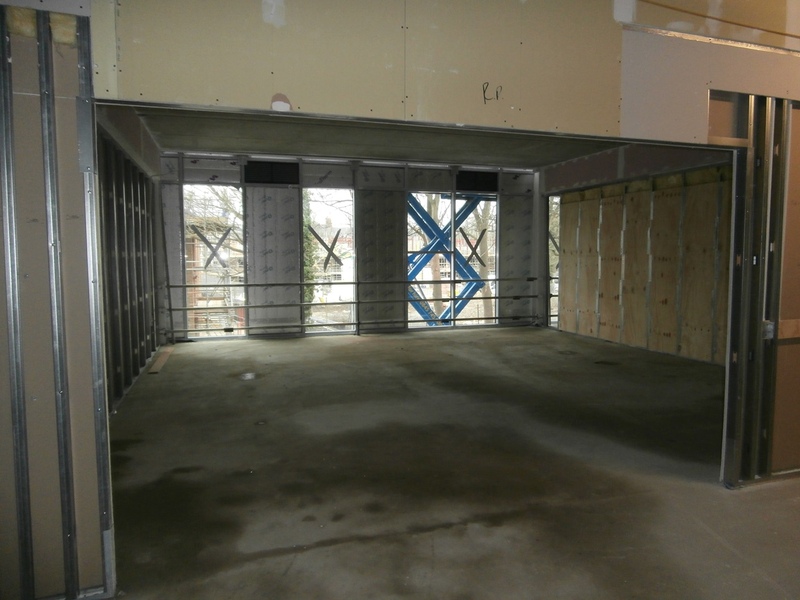 As we hit the first floor I could see just how far the interior partition walls were advancing and on the top floor things were even more advanced. Very excitingly, rooms were definitely now taking shape. 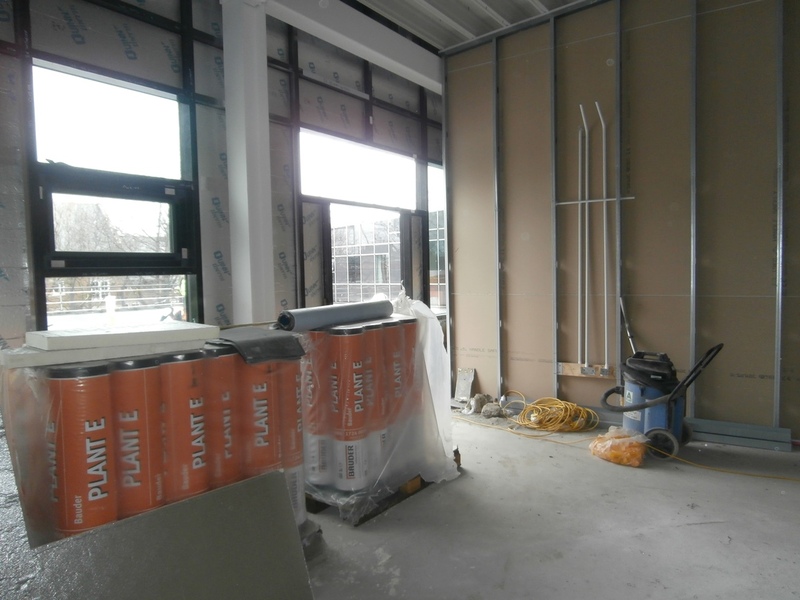 Pipework is now being fitted on the first floor. 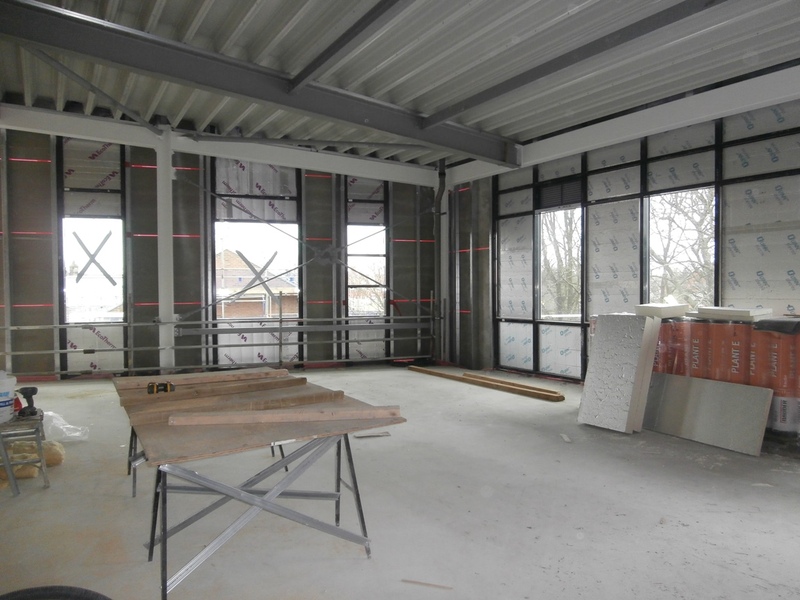 Room 45, a Biology Lab, is now taking shape on floor two. The exciting thing about EWA’s design for the second floor of the new building is that only two thirds of the actual floor area is taken up with classrooms. 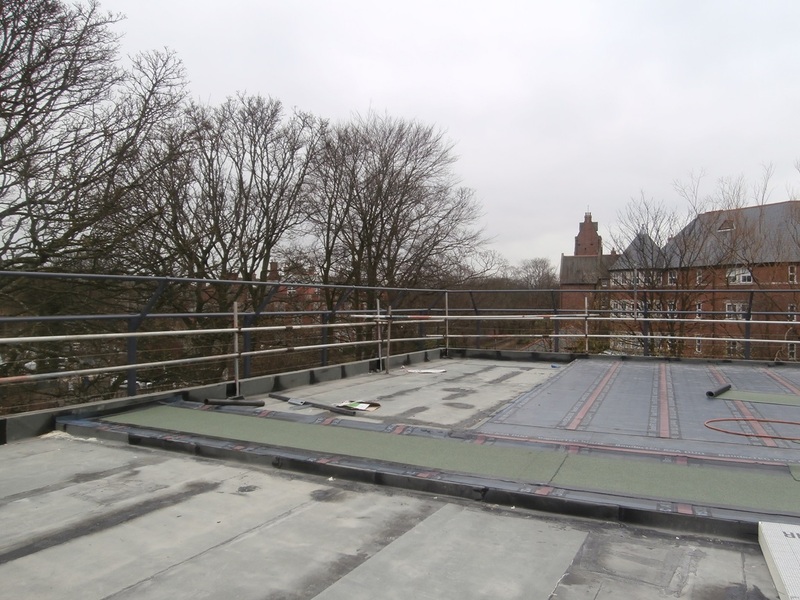 The south-west third is a Roof Terrace with a Roof Garden which can be accessed from the four labs adjacent to it. And it was the Roof Terrace that Peter wanted to show me today. 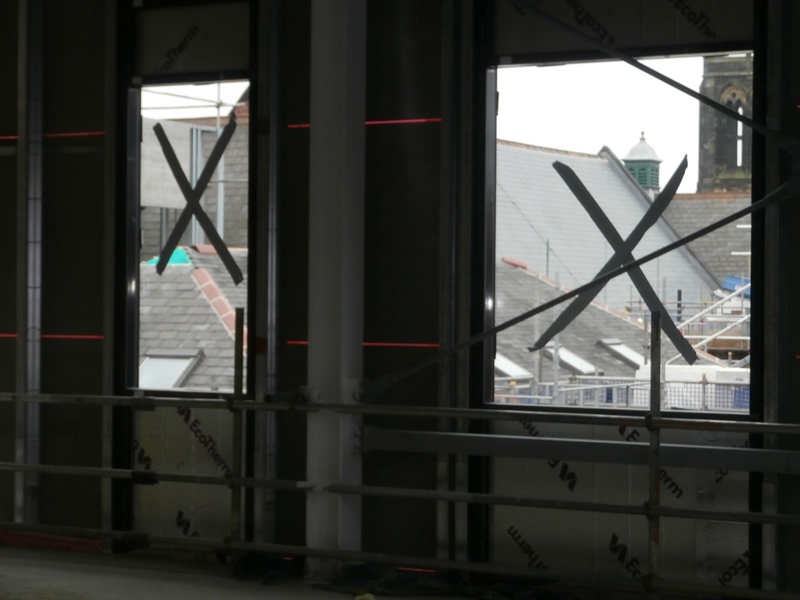 SW corner of the Roof Terrace looking onto St Mary’s Court. Reverse view looking back towards the NE corner of the Roof Terrace: Physics Lab (to left); Biology Labs (centre & right). 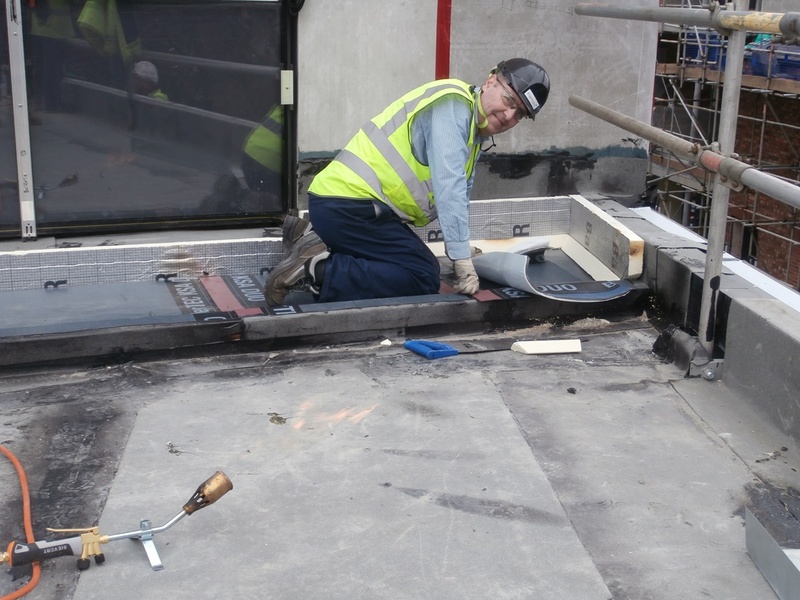 What Peter had brought me up to see was the roof surfacing actually being laid. It was a real hive of activity up there today. 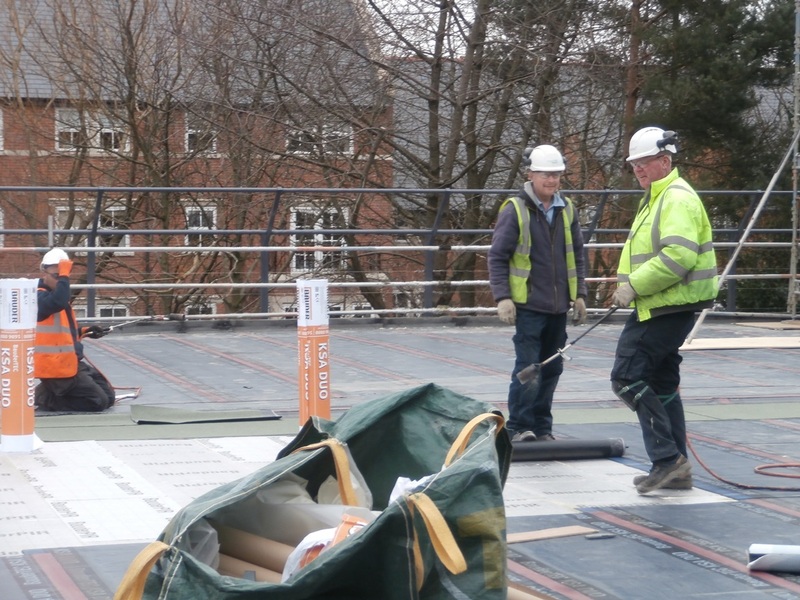 Up on the roof, the roofing felt was being laid down today. 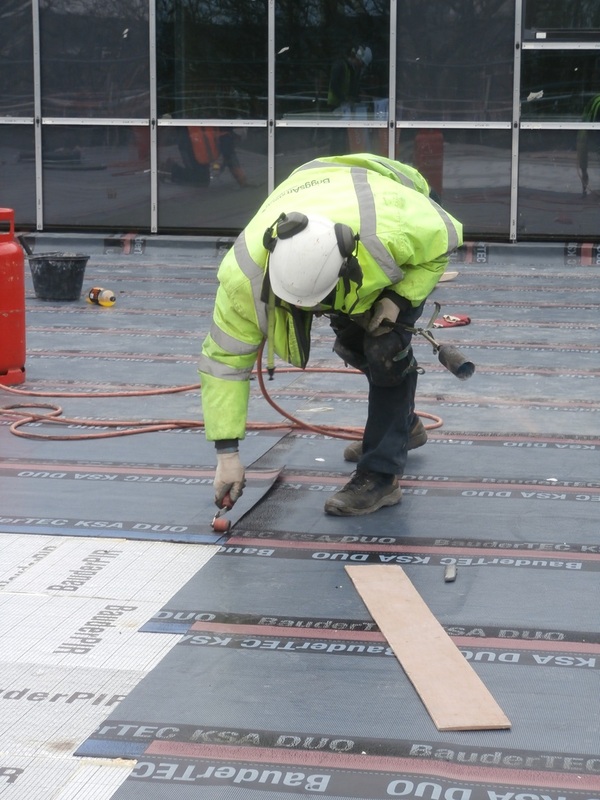 Straight-ahead of me, a very friendly workman was only too happy to show me how the process worked: heat is applied then a roller. First a blast of heat is applied by a blow-torch. 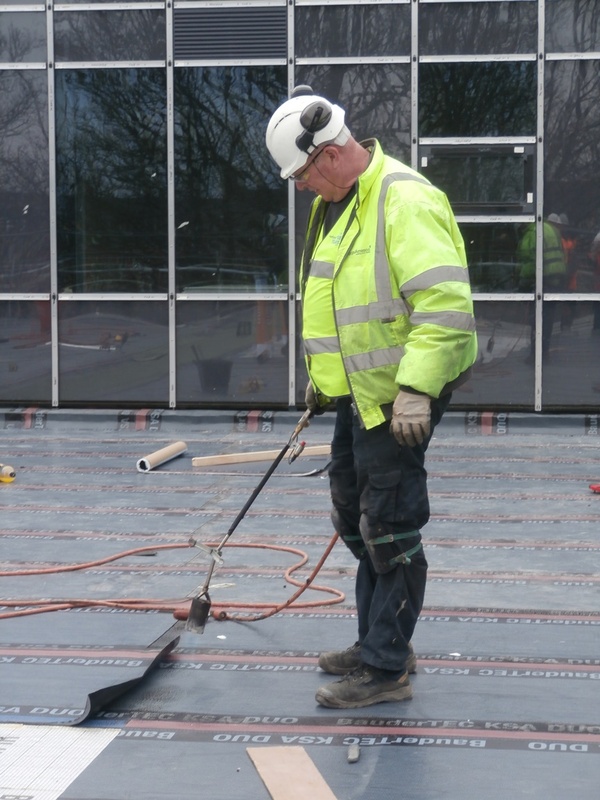 Immediately after, a roller is used on the join. 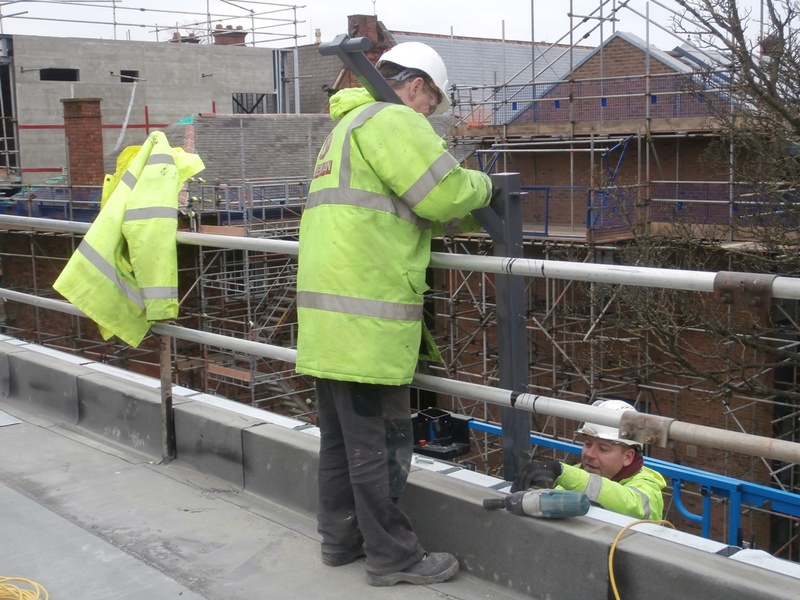 In the south east corner, nearest to the old building, not only was there felt being fitted, but work was being done on the railing too. Felt being laid in the south east corner of the Roof Terrace. Work also underway on the railings in the south east corner. On re-entering the building again through the roof door of Room 45, I took the opportunity to take some shots through the lab’s side windows which face onto the north elevation of the old building. The roof doorway of Room 45, the end Biology Laboratory. The side windows of Room 45 looking out over the rooftops of the old building towards Jesmond United Reformed Church. 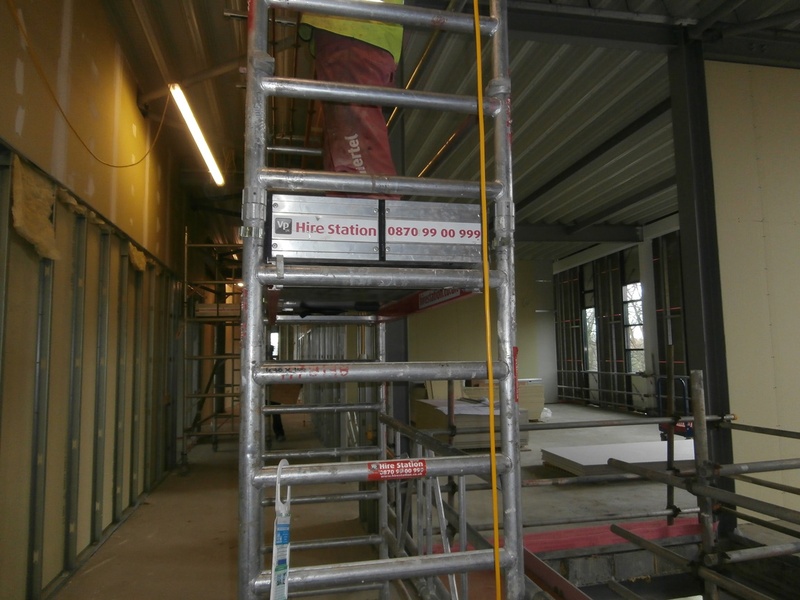 As on the first floor, along the central corridor running between the labs men were working on the ceiling pipe-work via scaffold towers. To the right of the central corridor, another lab can be seen. Descending to the first floor once again, it was necessary to keep making way for busy men moving to and fro carrying plaster-board. 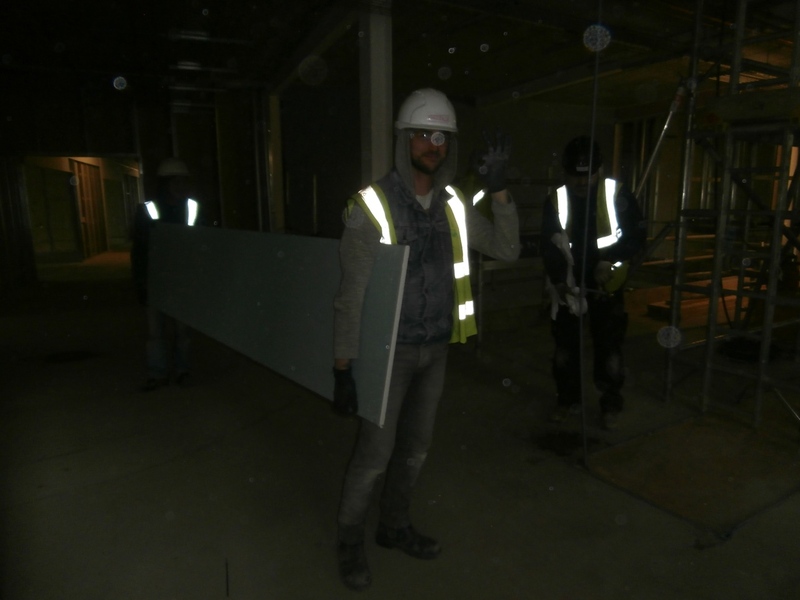 Plaster-board is constantly on the move on the first floor. 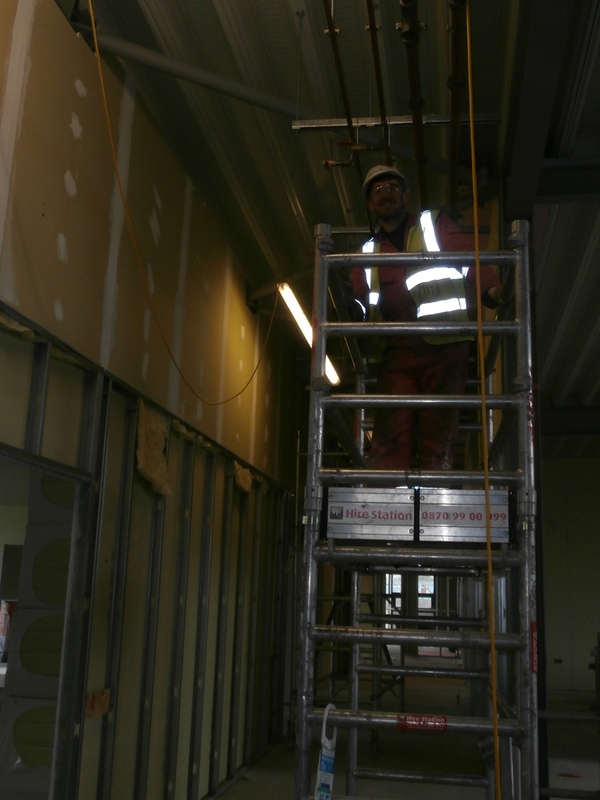 The design for the first floor of the new building features eleven rooms and two stairwells (each containing toilet cubicles) on three sides. 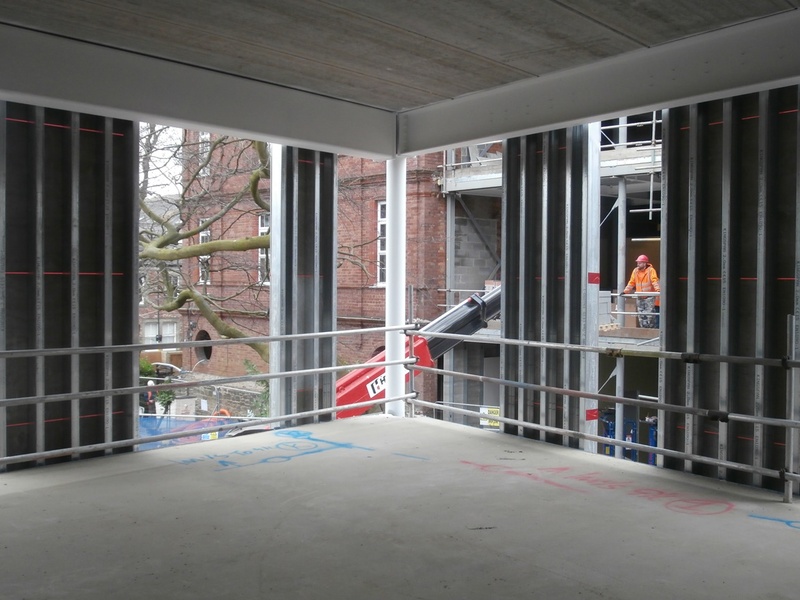 The fourth side, facing St Mary’s Court, and the entire centre section is taken up by the upper half of the new school assembly hall. Looking down into the main Hall from the first floor corridor. 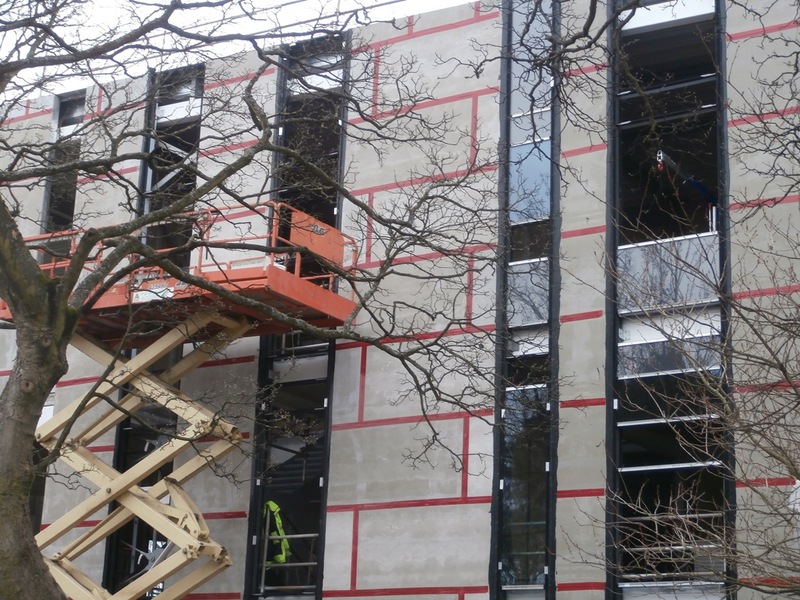 The three classrooms on the south side of the first floor are all allocated to Mathematics. Their windows face onto the old building. One of the five Mathematics rooms situated on the first floor. The last room I managed to sneak a look into before we returned to ground level has a dual aspect and should be a very sunny room. 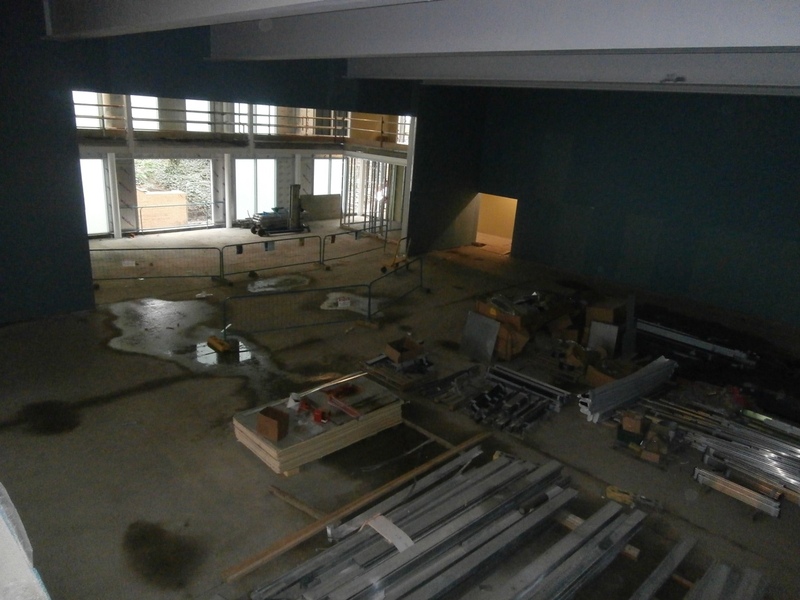 This room was of particular interest to me because it is going to be the new staff room. I’m not sure how much time I will manage to actually spend in there since I’ll be based in my beloved old building. 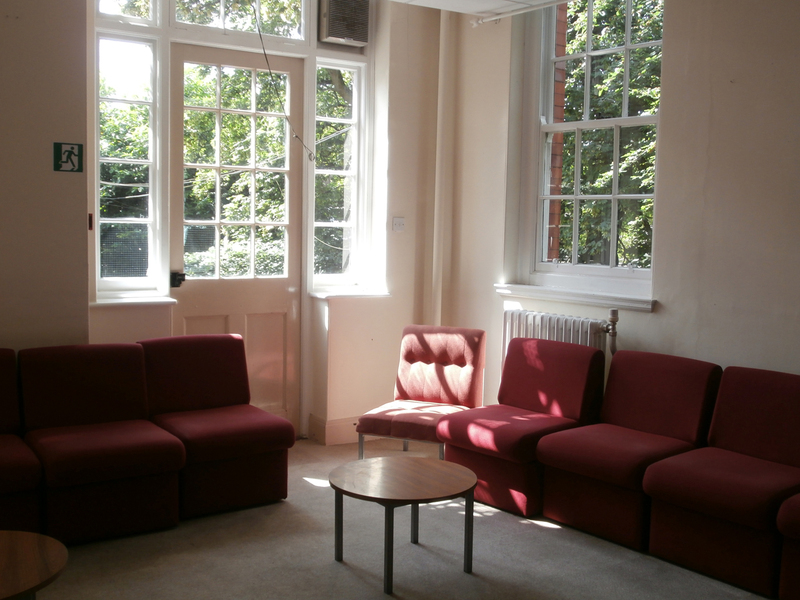 However, it’s nice to think my favourite sunny corner of the Church High social staff room could very possibly be recreated once again. 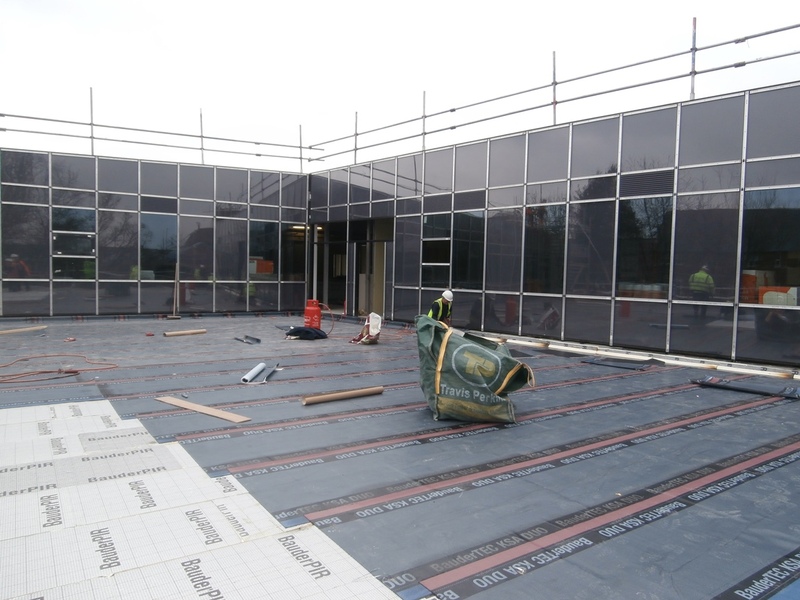 The staffroom will now be on the first floor of the new building; the angled corner fittingly points towards the old one. My favourite corner of the Church High social staffroom. The window to the right is at the very centre of the image above.